Star Wars: The Force Awakens is expected to have the second biggest weekend of all time, a record currently held onto by this past summer's Jurassic World. AMC is helping to entice returning costumers back to their IMAX 3D theaters with an exclusive new poster every Sunday. And the one for this Holiday weekend is quite spectacular. It features Poe Dameron standing on the wing of his ship as he watches his X-Wing squadron fly off to face the dreaded Starkiller base. Last Sunday saw the first poster in this series, which featured Rey and BB-8 walking into the Jakku sunset. AMC announced their "Star Wars Sundays" promotion way back in October. Each Sunday, from December 20 to January 10, guests who purchase a ticket to see Star Wars: The Force Awakens at AMC theaters will receive an AMC-exclusive Star Wars print from artist Dan Mumford with a new poster set to be revealed every week. We're not sure which posters will arrive next, but there are only two more to go. 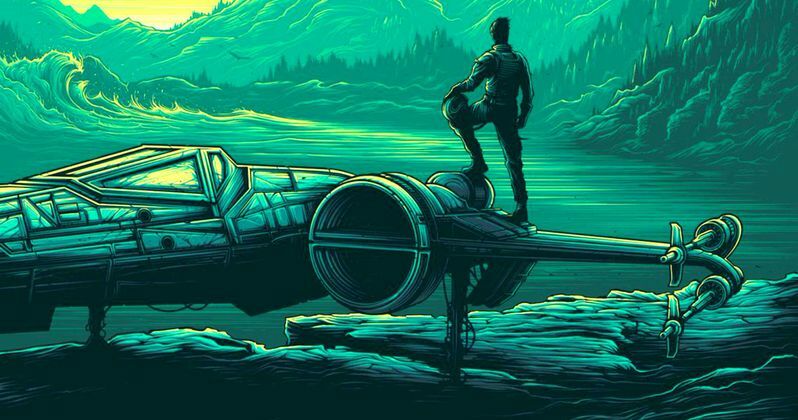 Will Han Solo and Chewbacca get their own Dan Mumford poster? Or will it be Finn and Kylo Ren? There have been a number of posters released for Star Wars: The Force Awakens leading up to its release. Perhaps the coolest one came during the Disney D23 Expo and features exclusive new art from Drew Struzan. It was given away to people who attended the event, but has not been used to promote the movie in theaters. Instead, we got a much more traditional one-sheet which featured almost all of the major characters from this new film in the Star Wars saga, except for Luke Skywalker. This was followed by a number of character posters that included Han, General Leia, Kylo Ren, Poe Dameron, BB-8, Rey and Finn. Hopefully we'll get a Luke Skywalker poster next week, as it enters it's third week of release. We also reported over the weekend that this long-anticipated sequel will be available to own on VOD this Spring. An official release date has not been set, and it isn't known how long after the VOD release that Star Wars: The Force Awakens will come to Blu-ray and DVD. It's expected that we'll see the VOD as early as April, with the home video release hitting in May. There is even talk that we could be looking at a Star Wars Day release on May 4th. Apple is offering Star Wars: The Force Awakens for pre-order, as is Amazon and other online retailers. We're not sure when Disney and LucasFilm will announce the arrival date. But if you don't have spring break plans yet, you might now! J.J. Abrams is directing from a screenplay he co-wrote with Lawrence Kasdan and Michael Arndt. Kathleen Kennedy, J.J. Abrams and Bryan Burk are producing with Tommy Harper and Jason D. McGatlin serving as executive producers. Star Wars: The Force Awakens will be followed by the first spinoff, Rogue One: A Star Wars Story, arriving on December 16, 2016. Star Wars: Episode VIII is slated for release on May 26, 2017, with Star Wars Anthology: Han Solo Movie arriving on May 25, 2018 and Star Wars: Episode IX premiering sometime in 2019. Take a look at this latest exclusive poster. Will you be heading to AMC this Sunday to get yours?